This blog will be seven years old later in the year and while I've always posted reviews of children's books and occasionally professional books, I've never written a review of a book that I've read for my own personal enjoyment. I love to read a variety of genres--though I lean towards modern day fantasy--and in 2017 I read 55 books! I've kept a book journal since 2004 so I can keep track of all the titles. But now that I'm retired I thought I'd expand my book journal and share it here. After all, nothing feeds the soul more than a great book. Creative downtime is important for everyone, but especially teachers, who have very stressful jobs. Hopefully, this review will be helpful in that regard. I started The Book of Joy during Christmas week and finished it on New Year's Day. From Amazon: "Nobel Peace Price Laureates His Holiness the Dalai Lama and Archbishop Desmond Tutu have survived more than fifty years of exile and the soul-crushing violence of oppression. Despite their hardships--or, as they would say, because of them--they are two of the most joyful people on the planet. In April 2015, Archbishop Tutu traveled to the Dalai Lama's home in Dharamsala, India, to celebrate His Holiness's eightieth birthday and to create what they hoped would be a gift for others. They looked back on their long lives to answer a single burning question: How do we find joy in the face of life's inevitable suffering?" My Takeaway: I enjoyed this book immensely, though to be perfectly honest I wasn't blown away by it, since many of the concepts were already familiar to me, and probably will be to you, too. However, for anyone who's looking for a feel-good, inspirational read, I highly recommend it. The reader is treated to highlights from a five-day conversation about the nature of joy and suffering. What I found most charming about the book was the way these two men constantly and good-naturedly teased each other. It was very sweet. And surprisingly (at least to me) they are both very down-to-earth men ... very human and humble. May all beings attain happiness. May all beings be free from suffering. May all beings never be separated from joy. May all beings abide in equanimity. It's no secret to any teacher that the more joyful and light-hearted a classroom is, the more learning takes place. 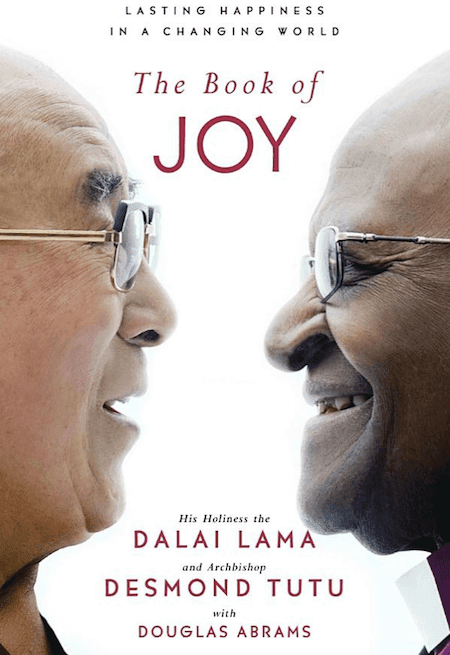 Before you go, be sure to watch this video of the Dalai Lama and Desmond Tutu. It's short and very sweet.